How do I... in Active Directory? How do I... in Group Policy? How do I... in Windows Server 2008? How do I... in SQL Server 2008? How do I... in SQL Server 2012? How do I... in Windows 7? 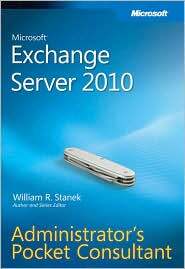 How do I... in Exchange Server 2010? How do I... in IIS 7.0? SQL Server 2012 Pocket Consultant features the all new cover and interior design that was first introduced with my popular Optimizing Windows 7 Pocket Consultant. It's a 600-page hands-on guide for the Standard, Business Intelligence, Enterprise, and Developer editions of SQL Server. Since completing work on Active Directory Administrator's Pocket Consultant, Group Policy Administrator's Pocket Consultant and PowerShell 2.0 Administrator's Pocket Consultant, I've been heads down working on a slate of new books. The first of these books is Windows 7 Administrator's Pocket Consultant, which ships to the printers on Wednesday (8/12) and is being released on 8/26. Windows 7 Administrator's Pocket Consultant is 672 pages and meant for administrators and developers. 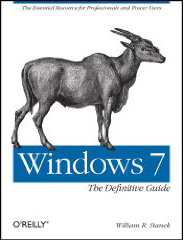 Next is Windows 7: The Definitive Guide. I just finished writing the final chapter. The book's being published on 10/22. Lots of work to do between now and then as I'm just starting the editing and review phase. The book's 1025 pages. It's huge! 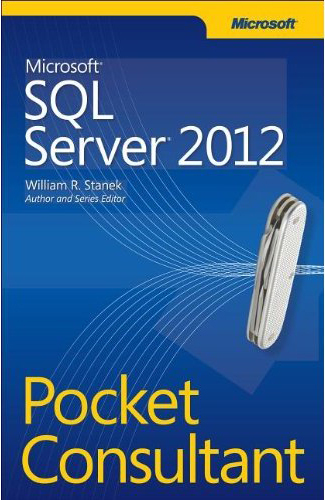 The final book is Exchange Server 2010 Administrator's Pocket Consultant. I'm writing the final chapter and front matter this week, then will start editing and review. Exchange 2010 essentially is a new product as everything about Exchange has changed from basic security on up. Exchange Server 2010 Administrator's Pocket Consultant is being published on 10/7. Completing 2200+ pages of writing was exhausting. Definitely needing some R&R, especially as this follows 1000+ pages of writing previously. The next few months of editing and review are going to be intense. 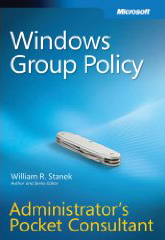 Windows Group Policy Administrator's Pocket Consultant (ISBN: 9780735626768) was published on February 11. It’s my 98th published book and 30th for Microsoft Press. My 99th and 100th books will be Windows 7 Administrator’s Pocket Consultant and Windows Server 2008 R2 Inside Out, not necessarily in that order. Windows Group Policy Administrator's Pocket Consultant is written from start to finish for Advanced Group Policy Management (AGPM), Group Policy Preferences (GPP) and standard Group Policy settings. The Introduction, outline and additional details for Windows Group Policy Administrator's Pocket Consultant are here. 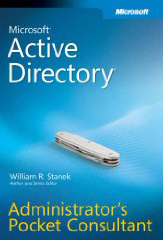 Active Directory Administrator's Pocket Consultant (ISBN: 978-0735626485) was published on January 14. It’s my 97th published book and 29th for Microsoft Press. My 98th, 99th and 100th books will be Group Policy Administrator's Pocket Consultant, Windows 7 Administrator’s Pocket Consultant and Windows Server 2008 R2 Inside Out, not necessarily in that order. Buy the book. Active Directory Administrator's Pocket Consultant focuses on core administration for domain controllers, operations masters, bridgehead servers and all the other physical and logical components of Active Directory. The Introduction, outline and additional details for Active Directory Administrator's Pocket Consultant are here. Ounce for ounce and dollar for dollar, the Pocket Consultant series from Microsoft Press is one of the best values around. The editors do a good job of recruiting competent authors and having them comply with well-thought-out style and formatting rules. Microsoft Windows XP Professional Administrator's Pocket Consultant is one of the gems of the series. 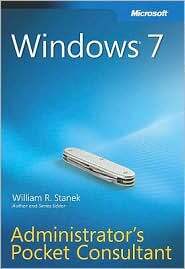 Author William Stanek has spent time working with his subject--this book wasn't rushed to market to match the Windows XP release date--and he's good at revealing its administrative procedures clearly and concisely. The book is nicely indexed, so locating the section you need takes very little effort. This book--slightly larger than a paperback novel--is ideal for a harried administrator responsible for many different software products, as well as for consultants who need to learn how to use Windows XP Professional in a hurry. A particularly nice characteristic of Stanek's style: His skill at combining straight procedures ("Just follow these steps and it'll work") with supplementary information about options ("On the other hand, if you're doing something unusual, you might need to modify the standard procedure a bit"). As no real-life installation of Windows XP ever seems to match authors' ideas of normalcy, the supplementary information is critical. Screen shots are nicely handled as well. Their presence helps clarify what the text means, but they're not so large as to waste space. Whether you're upgrading your entire enterprise or simply buying new PCs on an ad hoc basis, Windows XP Professional is coming into your enterprise. If you're responsible for supporting or administering it, this handy pocket guide offers you more useful answers per ounce than any other book we've seen. It's especially strong on XP's new administrative features, and those really important tasks (like setting up desktop VPN connections) that you won't do often enough to memorize on your own. The book's organized into four sections: essentials, core administration, networking, and optimization/recovery. In 350 pages, it manages to be remarkably complete. Want to use Windows XP's new Remote Assistance feature to resolve users' problems without leaving your computer? Prohibit users from setting up Internet Connection Sharing on your DNS domain? Set a new home page for all your users at once? Place custom content on each user's desktop? Use System Restore across a network? Lock the taskbar, so it can't be moved or lost? William B. Stanek walks you through all these tasks, and more. We could go on. Setting disk quotas. Managing security zones. Using notebook power schemes. Rolling back troublesome driver versions. Checking the status of a LAN connection. Configuring the synchronization of offline files. If you need to do it as a manager or support professional, there's no faster way to find out how. The practical, portable guide to Windows® Vista! Whether you support 50 desktops or 5000, this indispensable guide provides fast answers for the day-to-day administration of the Windows® Vista operating system. This pocket-sized resource zeroes in on essential desktop support issues and procedures—delivering critical details through quick-reference tables, step-by-step instructions, and lists. It's the precise information you need to solve problems and get the job done—whether you're at your desk or in the field! Imagine a gigantic book packed with expert Windows Server 2003 help for experienced professionals, written by one of the world’s most respected Windows authors, with the benefit of insider access to Microsoft’s own development teams. You’ve just imagined Microsoft Windows Server 2003 Inside Out. William R. Stanek covers every nook and cranny, from remote installation to disaster recovery. Along the way, you’ll find lengthy chapters on topics some Windows Server 2003 books barely touch upon -- for instance, optimizing performance and managing the Registry. Active Directory planning, setup, and migration are covered in depth. So is practically everything you can do with AD once it’s running -- from prestaging clients to publishing shares to authorizing DHCP servers. Take your Windows Server 2003 knowledge to the next level! Designed for Windows system administrators, this definitive resource delivers in-depth information about installing and configuring Windows Server 2003, performing upgrades and migrations, automating deployments, implementing security features, managing software updates and patches, administering users and accounts, managing Active Directory® directory services, and more. With INSIDE OUT, you'll discover the best and fastest ways to perform core administrative tasks, with an award-winning format that makes it easy to find exactly the tips, troubleshooting solutions, and workarounds you need. In addition, the CD-ROM contains an eBook and more than 100 timesaving tools and scripts. If you were to distill Windows Server 2003 into 500 pages of specific, trustworthy, fast-access answers for system administrators, you’d wind up with something like Microsoft Windows Server 2003 Administrator’s Pocket Consultant. William Stanek begins with a high-level look at Microsoft’s tools for managing Windows Server 2003 plus detailed coverage of monitoring processes, services, and events and a full chapter on support techniques -- including Remote Desktop. He also presents a solid overview of the many ways in which you can automate Windows Server administration, including group policies, scripting, security templates, and the Scheduled Task Wizard. Next, he tackles Active Directory administration, focusing on the tasks you’re most likely to be involved with: creating, managing, and resetting accounts; managing organizational units; setting privileges and logon rights; working with groups; managing user profiles; and more. There’s a full section on administering data: managing hard drives, working with basic and dynamic disks, administering volume sets and RAID arrays, controlling shares and permissions, auditing, quotas, and more. Stanek covers backup/recovery in detail -- for example, showing you how to avoid the pitfalls associated with recovering encrypted data. The book’s final section demystifies networking: not only TCP/IP, DHCP, DNS, and WINS but printer troubleshooting, remote access security, and other essential topics. Unless you're a kangaroo, this book won’t quite fit in your pocket. But it is small enough to take anywhere you’re working. And it’s useful enough that you'll want to. Here's the practical, pocket-sized reference for IT professionals supporting Windows .NET Server. Designed for quick referencing, this portable guide covers all the essentials for performing everyday system-administration tasks. Topics include managing workstations and servers, using Microsoft Active Directory services, creating and administering user and group accounts, managing files and directories, data security and auditing, data back-up and recovery, network administration using TCP/IP, WINS, and DNS, and more. The practical, portable guide to Windows® XP Professional! Whether you support 50 desktops or 5000, this indispensable guide provides fast answers for the day-to-day administration of the Windows® XP Professional operating system. This pocket-sized resource zeroes in on essential desktop support issues and procedures—delivering critical details through quick-reference tables, step-by-step instructions, and lists. It's the precise information you need to solve problems and get the job done—whether you're at your desk or in the field! I used to write a lot of for magazine, but haven't had much time lately. (Does anyone ever have enough time to do everything they want? :-) In the heydays of the 90's I wrote a heck of a lot of articles for PC Magazine and Dr. Dobbs. Anyway, the following are a list of some of my favorite articles. Most of the PC Magazine articles you can still find on the PC Magazine site. My books are available at bookstores throughout the U.S., Canada, UK, Germany, France, and many other countries. If the bookstore doesn't have the book on the shelf, you can ask the store to order it for you. And, I really hope you will. Be aware that if any site other than O'Reilly Safari has an e-book version of my books it is not a legitimate copy. The only legitimate copies of the books are the printed versions sold through bookstores and the e-book versions on O'Reilly Safari.